This Tree of Life tapestry inspired by the work of Morris and Dearle from the Victorian era, in the English renaissance of arts and crafts, we see a cream version. Here the olive blue green leaves compliment the cream background superbly. The star shaped flowers of the tree also feature and compliment the wood texture of the tree trunk. 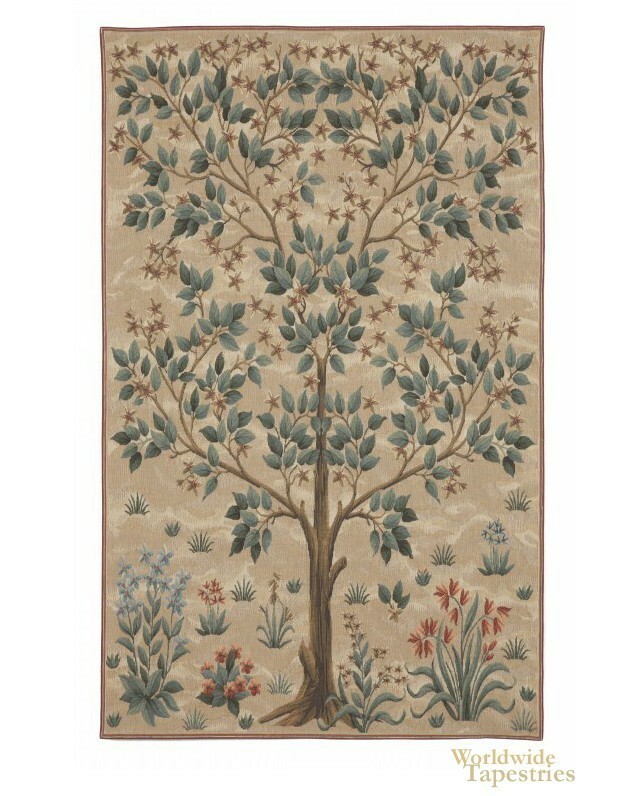 This tress of life tapestry add elegance to any setting and brings the beauty of nature to the indoors. The tree also represents the force of nature and life giving properties which is symbolised by the immortal tree. This tapestry is lined and has a sleeve along the top for easy hanging. Note: tapestry rod, tassels and accessories, are purchased separately. Note: This item ships from the UK (United Kingdom). Dimensions: W 25" x H 39"